You lift weights for strong muscles and take a seasonal flu vaccination to reduce the risk of being sidelined by a nasty bug. But flu shots are generally given in the arm, which can cause some pain and swelling. Generally, there are no restrictions after a flu shot and it's fine to get on with your normal weightlifting routine. Sometimes, however, the side effects can make you feel less than ready to hit the gym and begin lifting weights again. After you receive your flu shot, expect to have some side effects, such as redness, soreness and swelling at the injection site, according to the Centers for Disease Control and Prevention. This soreness is often the result of a person's immune system creating protective antibodies in response to receiving the vaccine, which is what allows your body to fight the flu. Ask your doctor to administer the vaccine in your nondominant arm. This will allow you to continue normal daily activities, even if you experience soreness. In some cases, you may also experience mild, flu-like symptoms such as muscle pain, fever or weakness. These should not last for more than two days after the vaccination. In rare cases, individuals have an allergic reaction to the flu vaccine. Symptoms include difficulty breathing, hives, weakness, rapid heartbeat or dizziness. If you experience these symptoms, contact your doctor immediately as the reaction can be life-threatening. Ask your physician about the benefits of exercise after a flu shot. In most cases, you can resume your normal exercise and weightlifting routine. 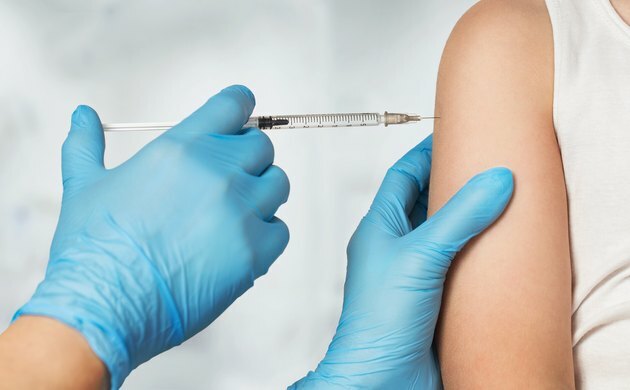 Researchers at Iowa State University found that when college students exercised after receiving a flu vaccine, it almost doubled their antibody response, compared to the college students who were sedentary after the vaccine. Dr. Kate Edwards from the Faculty of Health Science's Exercise and Sport Science unit, University of Sydney, recommends moderate exercise after a flu shot. This is not the time to push for a personal best but rather to complete a moderate lifting workout. Stay hydrated, which means drinking plenty of water during your workout and throughout the day, to support your body as it builds up its immune response to the flu. Stretch and warm up well before doing any lifting, especially the arm in which you received your flu shot. Soreness in your arm is normal, but movement and exercise after the flu vaccine will help to decrease pain and increase blood flow, advises American Lung Association volunteer spokesperson and allergist/immunologist Dr. Juanita Mora. Start light and ease back into lifting weights. If you feel good after your warmup, move forward with your normal routine. If arm soreness is getting in the way, consider focusing more on your lower body and core until your arm feels better. If you experience pain, stop lifting. Consider another activity, such as bicycling, if you are not experiencing other symptoms. Stretch after your workout, especially your arm, and drink extra water after your weightlifting session. Rest after a flu shot may be best if you're experiencing flu-like symptoms and side effects. If you have nausea or dizziness, it may not be safe to lift weights. If the symptoms are severe or worsen, consult your doctor. See a health care provider if you develop fever or extreme discomfort or if side effects don't subside after two or three days.